I'm looking for opinions as to what is causing no improvement in Abby's feet, despite being treated for bumble foot, urine scald or pressure sores. I've been told to keep her on meta cam and her feet will always be red. Vets seem very unconcerned! Three vets, 3 months, no improvement. I have a pic but don't see an option to upload it here. You can email it to me. Is the foot swollen? The foot itself is not swollen. I'll fill in her history: When we noticed her red feet over 3 months ago, we took her to a standard vet (he's the vet to go to when you can't get to an exotic vet). He said they were pressure sores, keep her on Carefresh, exercise her more. Well Carefresh is harsh - we used Kaytee Clean and Cozy and had to spot clean it several times a day. There was no improvement - and she tended to sit in one corner only so we switched back to fleece. We added layers of extra fabric under it to cushion it more. Three weeks later we got into another exotics vet; declared it bumblefoot, rx'd metacam and Baytril for 2 weeks. We covered the corners and edges of the cage with lap pads and changed those out 2 -3 times a day. Our washer has a sanitize cycle, so the bedding is very clean. Days later her feet look the worst we've seen. Took her back, was told to let the meds work. At 2 weeks took her bIack, feet are still red and he told us they'll just always be red but she's fine - no more bumblefoot! Gave us more metacam. We hoped there would be improvement with more time; but no. Called the vet - they want to test for ringworm and some other weird thing. Um...if it was ringworm - we humans would be covered in it! Besides - she doesn't have any of the typical signs of ringworm. There's a page on guinealynx where people have used betadine, chlorhexidrine, corn pads, etc for dealing with bumblefoot - all of which our last vet said not to try. I'm at a loss at what to try next. Here is your pic. The toes look slightly swollen (this may be my imagination - I don't have guinea pigs right now). Do all the toes look the same? How old is your guinea pig again? You say the redness used to come and go? I want you to read over this page. I'm wondering if there are any circulatory issues. It sounds like you have been doing everything you can to address this. Initially, I wondered if this was not a normal variation in redness of foot depending on body temperature. Is the foot at all tender to the touch? (hard to tell because I am guessing most guinea pigs would flinch when you touched the bottoms of their feet). This has happened at our house (in the exact same spot) from time to time with pigs that are older; pigs (usually females) that don't move around much and sit in their own pee, and -- maybe most importantly -- have heart compromise (ditto Lynx' post, strongly). Their mobile site is less than ideal and I can't find a search button, but what you want is "silver sulfadiazene cream". Good luck and please keep us posted on how she's doing. Your diligent, careful care and cleanliness have kept this from being *much* worse than it is right now; keep it up. Abby is just over 2 years old. The redness/pinkness never goes away - but it changes in intensity. Bright red one day, a better looking pink the next. Even the amount or area of foot pad affected changes. Sometimes just the 1/4 back heel section, sometimes 50%. Sometimes she'll have 3 - 4 days where the foot stays a healing pink color and we think she's finally getting better - then suddenly it's as bad as ever. This is what makes me think that it pressure sores, not an infection. I don't have any experience with pressure sores, but read up on them. They are very, very slow to heal. As for this being a heart issue - well I sure hope not! But considering that Abby has be come MORE active, more personable, less skittish and now can enjoy being petted, over the lasts 6 months, I don't have any reason to think that. Just had her out last night for 45 minutes of floor time - and she was busy exploring a new room - making those happy chutting sounds I love to hear. Thank you so much for recognizing that I've been diligent in caring for her! You see, she's not my guinea pig. I live in her house, but her owner won't take her for medical care. After $400 in bills, and HOURS daily cleaning, monitoring, caring for her - I've gotten no recognition. Well, you certainly deserve it. You have probably saved her life, and that is not an exaggeration. Bless you and thank you for caring about her, and caring for her so well. If she were to have heart enlargement, it is readily treatable, minor/just developing cases especially. It's not like human heart conditions, with zillions of meds, tests, procedures, stents, surgery etc. etc. etc. One or two simple (and relatively cheap) oral medications daily can control the problem well for years. All that said, try the silver sulfadiazene cream first (while continuing to keep her scrupulously clean and dry). The stuff has worked wonders at our house, multiple times, for cases like this. What do you think this is? Bumblefoot? Pressure sores? Irritation from....something? Do I take her take to the vet...again? Ordering the silver cream now. First of all, you would need very small, preferably veterinary bandage. Alternatively, you may use a small piece of regular bandage or gauze and fix it in place with adhesive bandage tape. It is very important to remember, however, to not make the dressing too tight, and to remove it as soon as possible. 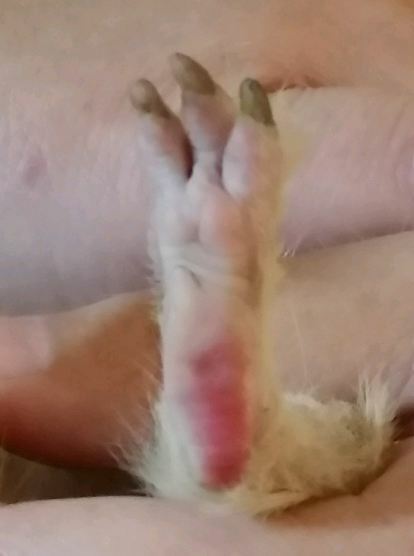 Tight dressings on piggie legs impede the blood flow, or even cut off blood supply, and lead to fatal consequences - necrosis or even necessity of amputation. Irritation from ... something??? => this one, in my opinion. Another vet trip??? => not yet, at least not in my opinion. We've had what you're describing (and photographing) happen many, many times at our house. Again imo only that's not bad enough to bandage; it'll be better to let air get to it. You ordered the right stuff. When you get it, apply a very thin layer (it doesn't soak in, so don't glob it on) to the red areas at least once a day (twice is okay), and see what happens. If she ingests a tiny amount of it while grooming herself, it won't hurt her. Good luck and plase keep us posted. Edit: without reading back, how big is her cage? She and her friend Bellpepper are in a 2x4 c and c cage. Which brings up another issue I was trying to address before all this happened. They don't enjoy their cage - have never done zoomies, don't like balls or stuffed animals. They LOVE tunnels and love to explore a room. We made collapsible grid cage that's more than twice their cage size...and that doesn't inspire them either. In other words, unless they're free to roam around a room, they don't get much fun or exercise. Sorry...have more to add but haven't learned how to edit yet. A big thanks to everyone who's read this and to those who've posted their thoughts. Lynx suggested trying All Free detergent (I think that was the brand) which we have started using. Our other detergent contains orange essential oil and that could be the problem. ( Despite what many MML companies try to preach; essential oils are not a cure for everything and can be downright harmful) Our other pig hasn't been affected - but he's not a typical pig, he's more like a dog! It will be about a week or so before the silvadene cream arrives; what do you think about using a Neosporin type ointment in the meantime? Is it safe to continue giving her a single dose of Metacam a day, or should we stop in order to protect her kidneys? Any pig safe topical pain creams? If you use the Neosporin, use it very sparingly and rub it in well with a q-tip. It can cause major digestive upset if it's ingested. And yes, it's safe to continue to give the Metacam. Can you put an old blanket or quilt down on the shaded balcony to protect her feet? Ditto on the detergent also. I used to mess with essential oils for myself (not the pigs), and orange can *sting* and turn your skin flaming red. that many pigs and rabbits end up having red feet without fungal or bacterial causes. They don't cause her pain, the skin is healthy - and this is just the normal thing from now on. Although...we do continue to keep her cage very, very, clean and check them for any new problems. Her heart and lungs are very good, as are her teeth. But an exam and ultrasound found a real problem - I'll start a new thread for that. A checkup today revealed that there's some kind of mass in Abby's abdomen; a brief ultrasound was done. She's a spade pig so ovarian cysts are out. She has no pain, she is happy, active, and doing all her normal things. We could have exploratory surgery now; but since it's risky we hesitate to do that because this may be a benign problem. We could wait a couple months and see if any symptoms show up and decide then. Even the vet is on the fence at this point. I contacted the rescue to get more specific info on her surgery; why she needed it and what exactly was done - perhaps something was left unfinished. Abby's about 3 years old. Do not start a new thread on the same guinea pig. Sometimes red feet reflect irritation, high blood circulation. Yes, thank you - I understand now to use the same thread, despite having a new health issue. Please read that post and tell me what you think.